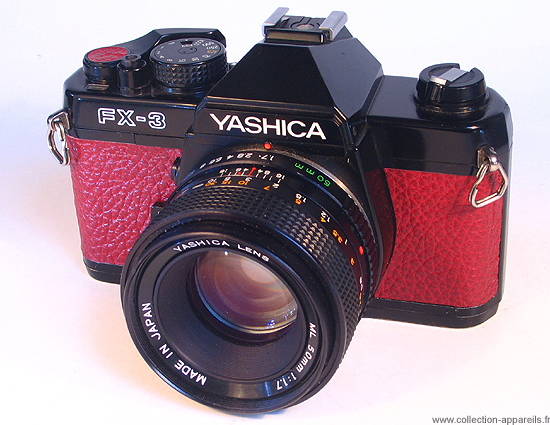 After the FX-1 and the FX-2, the FX-3 breaks the series by a body much more made round, entirely black, compact and covered with new flexible coating (to look at the picture and to question the owners of this camera, it is understood quickly that the biodegradation of the coating was involuntary and a little too fast). The hood is manufactured out of plastic, solid and not letting see the brass with the worn angles. The sole and the back are still out of metal. It is semi-automatic. The indication of the correct exposure, the over-exposure or under-exposure is ensured by three coloured LED. The photographic exposure meter uses element with silicon (blue !?). It is about a mechanical camera, of which the batteries are only used to supply the photographic exposure meter. All speeds and apertures are usable in the absence of batteries. The mirror before being raised, moves back of three millimeters.